I have walked by this building quite a few times and have really enjoyed it's look. Turns out that it is the head office of the Ontario Heritage Trust. The Ontario Heritage Foundation - the province's lead heritage agency - is dedicated to identifying, preserving, protecting and promoting Ontario's rich and varied heritage for the benefit of present and future generations. Their work is quite extensive and they own some very important properties and buildings such as The Elgin and Winter Garden Theaters in downtown Toronto and Sharon Temple, north of the city in East Gwillimbury. I love the duo doors and the windows above them. This building has so much character. The foundation found the perfect spot to use as the headquarters. was designated a national historic site of Canada because it is a good representative example of a transitional building which combined historical style with modern technology. With its rich Edwardian Baroque details, classical composition, steel frame and fireproofed surfaces, the Birkbeck Building represents a transitional period of urban commercial design which combined historical style with modern technology. Built in 1908 for The Canadian Birkbeck Investment and Savings Company, this four-storey office building is typical of many small financial institutions prevalent in central business districts of Canadian cities before World War I. The building has so many little details that I enjoy searching for when I see a structure like this. One final note. According to Tripadvisor, the building is a popular filming location Some movies that have shot scenes here include The Cinderella Man, Serendipity, Focus, The Rules of Engagement and Godsend, just to name a few. 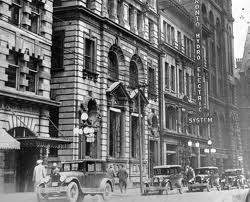 Here is an of old shot of the building from way back. Really enjoying your blog, just found this treasure trove of building commentary and short history!